All Hallow's Eve is now upon us as is Mexico's Day of the Dead. What a perfect time for another new member of the sinister Black Lantern Corps to emerge from the darkness. 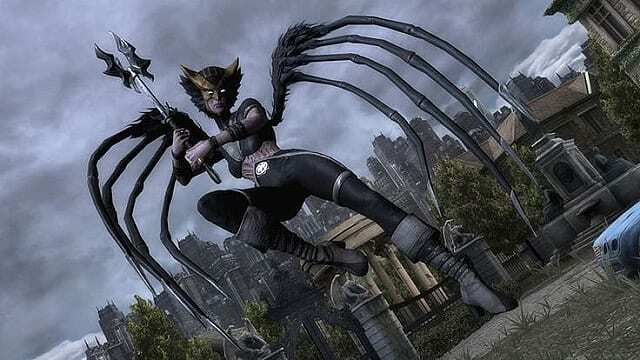 This special version of Hawkgirl has a new ability (Necrotic Lifeforce) which gives her health back if ANYONE in the battle is knocked out. And it can even resurrect any of her Blackest Night team members if they were already down. An ability like that makes her a perfect tag-team partner for any of the other Black Lantern Corp. members. A new second attack power Nth Blackness, a series of Necron-powered blows and mace smashes, has also been added. 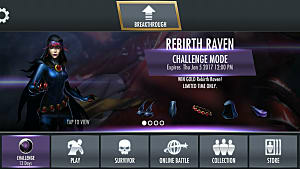 This Challenge Mode runs until Friday, November 11th. Complete all five challenges to add Hawkgirl to your roster, and you can attempt a more challenging Expert version, then go for Nightmare level. For each set of battles you win, you get a part of Shayera's gear (Mace, Boots, Buckle, Ring, and Helmet). 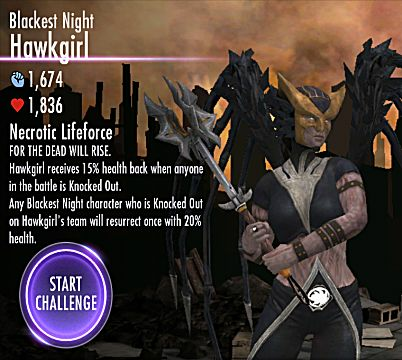 Once you have won all five challenges, a Gold Level Hawkgirl is added to your collection. 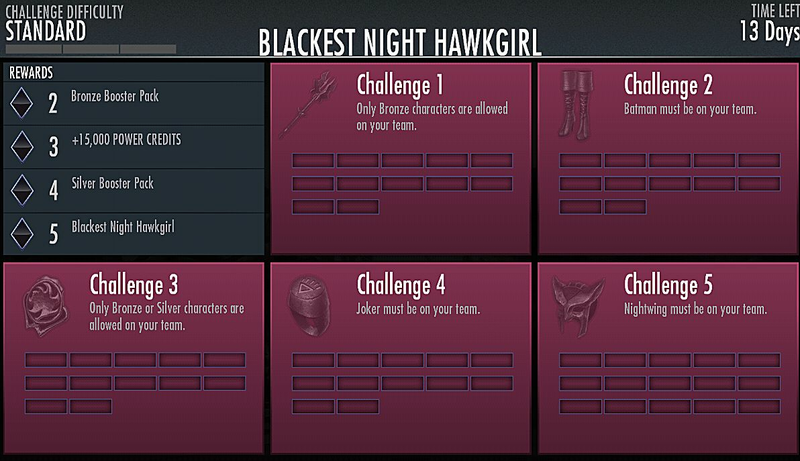 Here's some tips for conquering the 63 battles needed to win your Blackest Night Hawkgirl. 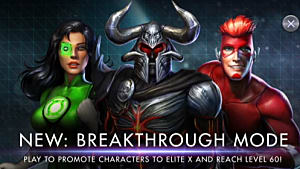 Challenge 1: Bronze Characters Only - Use an energy drainer like Luthor or Nightwing up front to deflect and build power, then Green Lantern for his Rocket Barrage or Deathstroke for Full Auto. 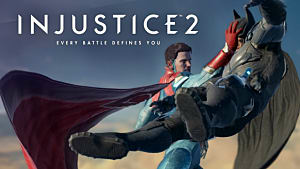 Challenge 2: Batman Must Be On Your Team - The only downside here is that ALL Batman characters are Gold. So, if you don't have him yet, you're going to have to cough up some heavy credits. Their basic first attack Explosive Batrang isn't that powerful but can stun for a better follow-up. 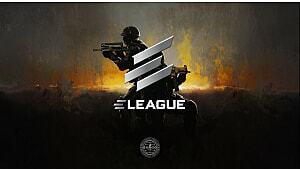 The Insurgency Batman's Lunge Kick is quite potent. Challenge 4: Joker Must Be On Your Team - All of the original Jokers have Bang!, which is a strong first attack. Their second attacks are all Damage Over Time. Team him with a tank like Bane or Doomsday and a Harley Quinn, if you have one. 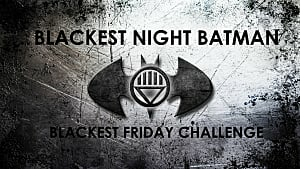 Challenge 5: NIghtwing Must Be On Your Team - The plus side is that there three Nightwing characters and nearly everyone has one. All three have Ground Sparks to drain opponents and give his teammates time to build up their own attacks. With the release of Blackest Night Hawkgirl, the ranks of the Black Lanterns becomes even more powerful. Blackest Night Martian Manhunter power drains. 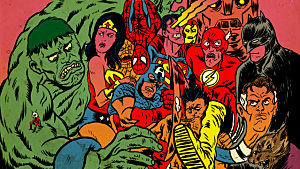 Blackest Night Doomsday and Blackest Night Batman's strength and damage grow as their opponents weaken. Combining any of them with Blackest Night Hawkgirl will make a very dangerous team, since her basic ability can REVIVE other Blackest Night characters. 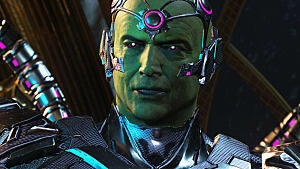 The console versions of Injustice: Gods Among Us released two Blackest Night Skin Packs. 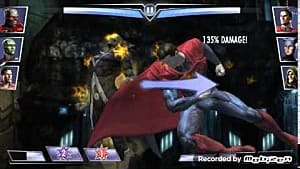 So far, the Blackest Night versions of The Flash, Aquaman, and Superman have NOT appeared on the mobile version. Yet. 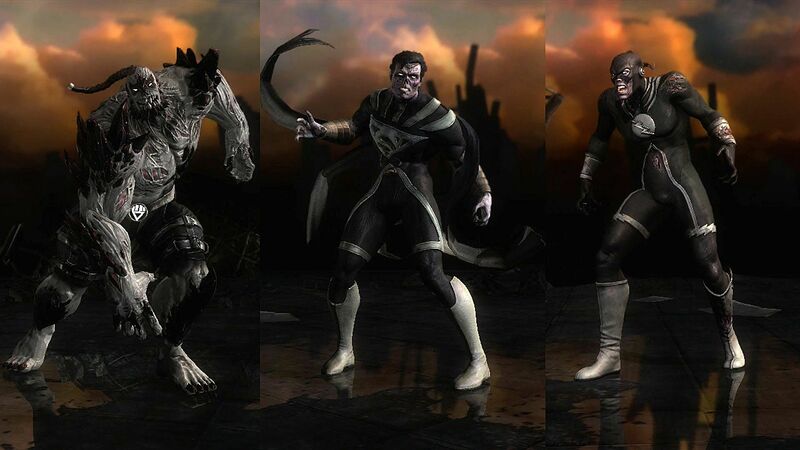 Which Injustice character would you love to see a Blackest Night version of? 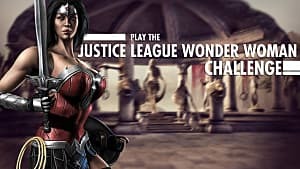 Are there other special versions of your favorite DC characters that NetherRealms should add to Injustice?